Other products by Hanna Instruments Inc.
Hanna items are not always in stock. Please call or email for availability. NBS (NIST) Buffers When measuring alkaline samples, you now have the choice of a wide range of pH 9 buffers as well as pH 10 solutions. 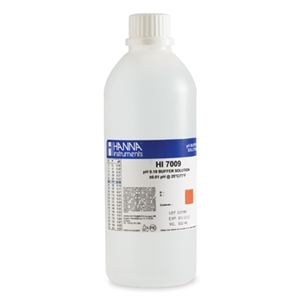 This provides you with greater versatility, especially with the microprocessor based Hanna portable HI 9625 and bench pH 301, pH meters which can both be calibrated at pH 9 and 10. The pH 9 buffers carry lot #, expiration dates as well as a pH/°C chart on every bottle. You also have the option of purchasing the new economical cases of 12 and 16. The HI 7009L/C and 8009L/C are supplied with an analysis certificate. NIST Traceable Hanna buffers are prepared using analytical grade chemicals in closely monitored laboratories with a pH meter that is calibrated to NBS/NIST primary standard buffer solutions (NIST 186Ie, 186IIe 191a and 192a). The buffer values are certified traceable to NIST 187c S.R.M. We only sell & ship chemicals to businesses at commercially zoned locations verified by 3rd party sources. A business at a residence will not be able to buy or receive chemicals at that location. Such businesses will not be able to divert shipment in order to meet our policies. No exceptions. © Copyright 2015 ESP CHEMICALS INC. All rights reserved.